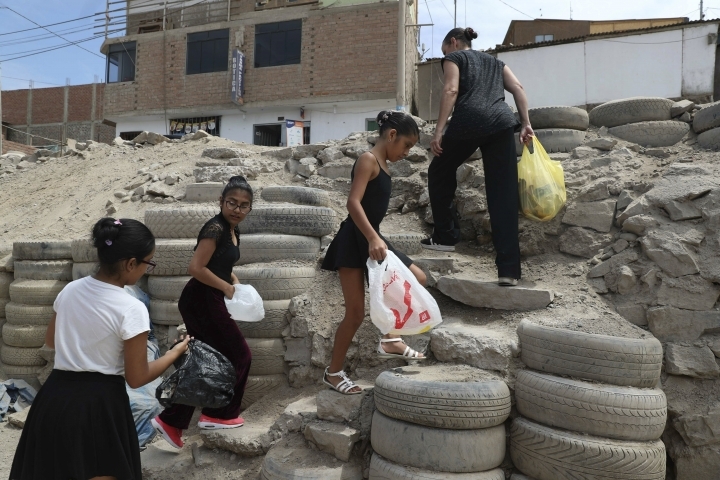 LIMA, Peru — In a Peruvian neighborhood where families consider running water a luxury, young girls are learning the delicate art of ballet dancing. In the classroom at a public school near the South American nation's Pacific coast, girls line up at wooden ballet barres, point toes and curve arms. "When I dance I forget about everything," 16-year-old Maria Cielo Cardenas said on a recent afternoon. "It's as if I were flying." The class led by Maria del Carmen Silva, a former professional dancer, is bringing classical ballet dancing to children from impoverished communities where leotards and shiny pink pointe shoes are seldom, if ever, seen. The 52-year-old teacher says her mission isn't just to teach girls how to plié, but to prepare them for a future outside the boundaries of their poor neighborhood. 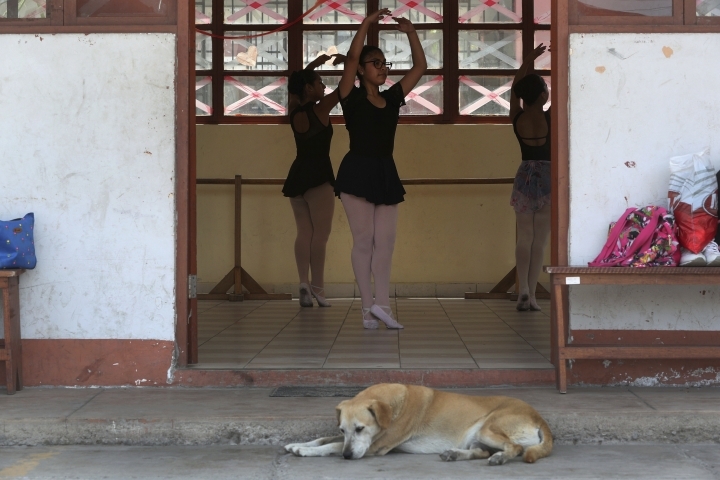 She takes students to dance in Lima's wealthiest districts in the hopes of building friendships between those who can and cannot easily afford a new ballet costume. Later this year, Silva also hopes to take them to Florida to participate in a dance competition, if she can raise enough money for plane tickets. "Ballet isn't known because it's so expensive," the former National Ballet of Peru dancer said. "You need to buy costumes, leotards and pointe shoes." Silva's initiative has sparked new dreams in the minds of girls for whom dance, let alone international travel, long seemed like a distant possibility. On any given afternoon, excited parents peer through the studio's windows to watch their daughters practice to the sound of Peter Ilyich Tchaikovsky's "Waltz of the Flowers." Many say they are experiencing ballet for the first time through their children. "The only ballet we'd heard about before was the story of a dancing rat," said Elcira Ruiz, the mother of two daughters, referring to a children's books series. Ruiz and her husband, who is nearly blind, attend all of their children's performances. She records the girls dancing on her cell phone, and her husband later watches them by holding the screen close to his failing eyes. Silva is convinced that the discipline required in ballet will teach life lessons to a group of students for whom hardship has come at an early age. Three sisters who dance together are living with their grandmother because their mother left to work in Spain and their father abandoned them. Cardenas frequently worries about her mother's failing kidneys, but says dance relieves her stress. Peru is a country where seven million people live on just $105 a month. Despite the country's economic stability, it has one of the region's lowest rates of investment in education. All of that means ballet is usually for the rich. While some wealthier parents have balked at Silva's initiative though, most have embraced it. For Cardenas, the chance to practice in the upscale district of Miraflores is like taking a step into a new world. She loves walking through the neighborhood's leafy streets, and she marvels at simple things like running water, which she does not have in her own home. "When I entered four years ago, I felt uncomfortable," she said of dancing with girls from entirely different backgrounds. "Now we are classmates, like sisters."